FileMaker took the wraps off the latest version of its flagship database application Tuesday, rolling out a major update to FileMaker Pro highlighted by new charting, reporting, and sharing tools. “This is a ‘back-to-basics’ release in terms of what we’re trying to accomplish,” Ryan Rosenberg, FileMaker’s vice president for marketing and services, told Macworld. To that end, the ability to make charts leads the changes rolled out in FileMaker Pro 11. 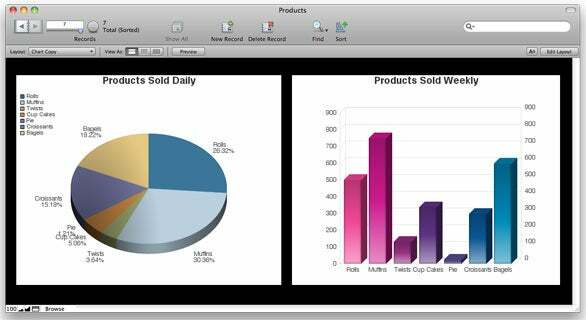 While third-party plug-ins made it possible to build charts in previous versions of the database program, version 11 builds those tools into FileMaker. Users can select from pie, bar, area, and line charts for a quick, graphic representation of data. They can also publish those charts to the Web via FileMaker Pro Instant Web Publishing. The ability to make charts is one of the major additions to FileMaker Pro 11, the new version of the venerable database application released Tuesday. In addition to charts, FileMaker 11 also introduces Quick Reports that let users group and summarize data on the fly. Quick Reports present subtotals and totals in a spreadsheet-like format similar to pivot tables. FileMaker Pro 11 also streamlines the Layout/Report Assistant for guiding users through setting up reports with grouped data. The application’s new Recurring Import feature lets users set up automatic imports for Excel and text files, one of the update’s many nods to productivity. Another productivity booster introduced in FileMaker Pro 11 is a Quick Find feature that should be familiar to anyone who’s ever used iTunes. This search field in the Status toolbar lets users type in a term to search across all fields within a layout. With version 11, FileMaker also added an Inspector that manages layout tools from one location. Object Badges help users identify scripted fields in their layouts with color-coded icons. Similarly, users can now highlight text, calling attention to key words or numbers in fields. Users can also now organize layouts into folders with drag-and-drop. FileMaker aims to make it easier to get started in version 11, making changes to the Quick Start screen that put the emphasis on managing favorite files and accessing resources. The company also added an invoices template to its Starter Solutions, bringing the number of such solutions to more than 30 in FileMaker Pro 11. On the collaboration front, FileMaker Pro 11 introduces Snapshot Link. With this feature, users can gag a specific set of records at a point in time to preserve the layout, view, and sort order in a Snapshot Link file. That file can be e-mailed to other FileMaker Pro 11 users who can open it to see the same set of data for easier collaboration. These changes not only appear in FileMaker Pro 11, but also FileMaker Pro 11 Advanced, the company’s offering for full-time database developers. Other changes to the Advanced version of FileMaker include the ability to copy, paste, and import custom functions into databases without having to re-key information, an improved script debugger, and a new interface for creating customized menus. FileMaker Pro 11 costs $299; existing users can upgrade fro $179. FileMaker Pro 11 Advanced costs $499, with a $299 upgrade price. FileMaker says its extending upgrade pricing to licensed users of FileMaker 8 and 8.5 through September 23, 2010; more details are available at FileMaker’s Website. FileMaker also updated its server offerings to version 11 on Tuesday. FileMaker Server 11 features an enhanced statistics view to help diagnose potential issues with FileMaker Pro clients. A new Backup File Clone capability in Server 11 that saves an empty version of any database so that a file’s schema and architecture can be preserved during troubleshooting. With FileMaker Server 11 Advanced, Filemaker has removed the limit on the number of users who can simultaneously access files over the network; managers can also securely assign access privileges to groups of users with the new version. FileMaker Server 11 costs $999; existing users can upgrade for $599. The new version of FileMaker Server Advanced costs $2,999 with a $1,799 upgrade price. 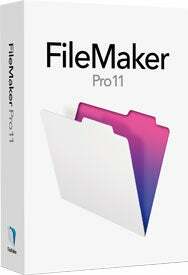 All FileMaker 11 products began shipping Tuesday. The new versions run on OS X 10.5.7 or higher, with 512MB of RAM for Leopard users and 1GB of RAM if you’re running the application in Snow Leopard.